Above: The entrance to the Gardens includes a gift shop and a garden shop. Below: The flowering plants present an array of colors. Above: A view from the train. 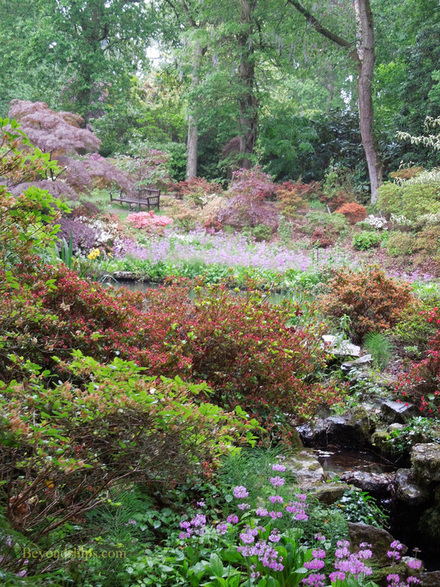 Exbury Gardens has been called the finest informal garden in England. In a country known for its lush and beautiful gardens, that is indeed high praise. 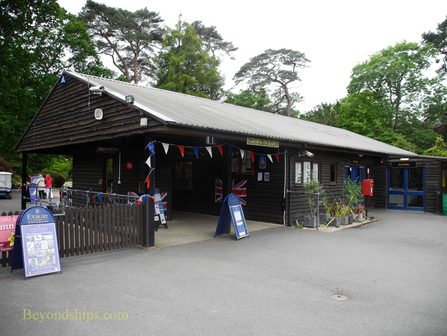 Thus, when Cunard's Queen Mary 2 offered guests who were traveling onwards from Southampton on QM2 or transferring to another Cunard ship a shore excursion to Exbury, I immediately signed on. Although I have planted a tree or two in my time, I am by no means an expert gardener. 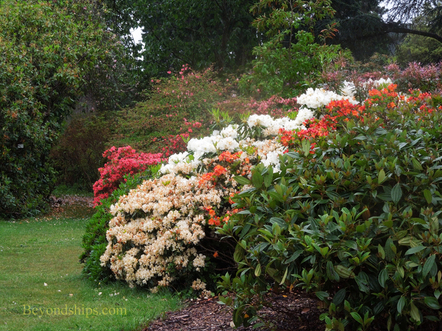 Thus, my interest in Exbury stemmed from a desire to experience a scenic place rather than from an interest in horticulture. 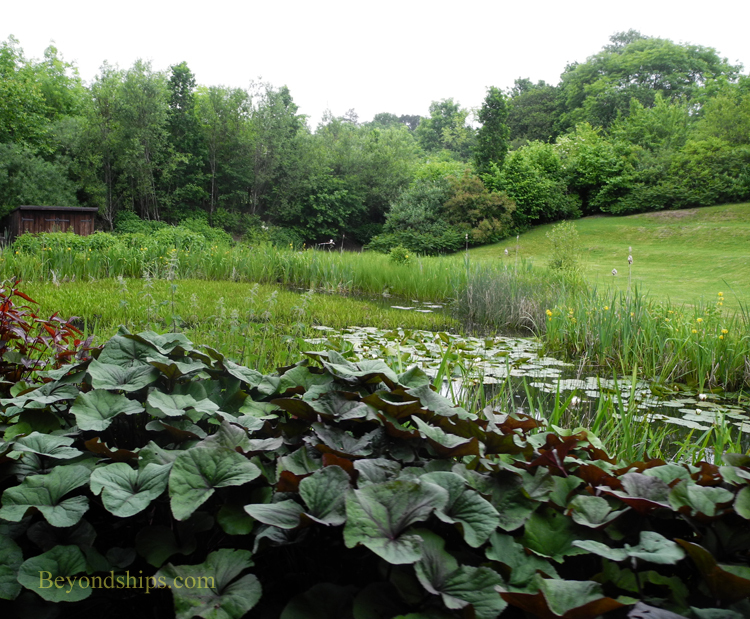 As I discovered, Exbury caters not just to gardening experts but to the average person as well. Exbury was the brainchild of Lionel Nathan de Rothschild A member of the English branch of the famous banking family, Lionel was expected to make his career in banking. However, at an early age, he became fascinated by horticulture and gardening, reportedly planting his first garden when he was age five. Lionel did as his family expected and entered banking. However, he always said that banking was a hobby and that gardening was his true profession. In the early years of the 20th Century, Lionel began looking for a property that he could use to create his dream garden. He wanted it to be near his friend Lord Montagu's home at Beaulieu because the two shared a passion for fast automobiles and fast boats. Therefore, his search focused on the New Forest area. Eventually in 1912, Lionel purchased Inchmerry House in Exbury but that property proved unsuitable for his planned garden. Consequently, when the neighboring Exbury House came on the market in 1919, he purchased that property, which had been the home of a branch of the Mitford family. Her Majesty reportedly replied: “That is very reassuring” and dashed off. During our visit, no royals were in evidence. However, even though the weather was threatening, there were a fair number of visitors in addition to our group. 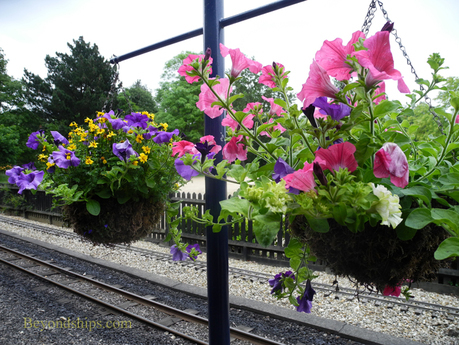 After walking along a path surrounded by tall trees and flowering plants, we came upon a small railway station. 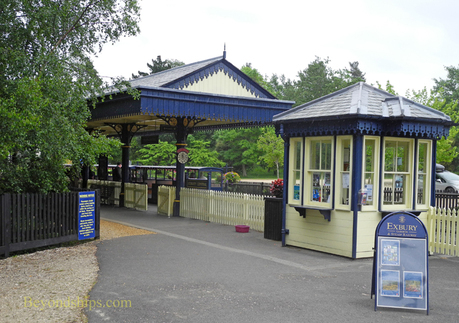 Inspired by the railway station at Aviemore in Scotland, this was Exbury Central Station, the main station on the Exbury Steam Railway. The railway was the dream of Leopold de Rothschild, Nathan's son, who had a passion for trains. It opened in 2001 and has been a surprising success with over half a million riders including Her Majesty who officially named one of the locomotives. 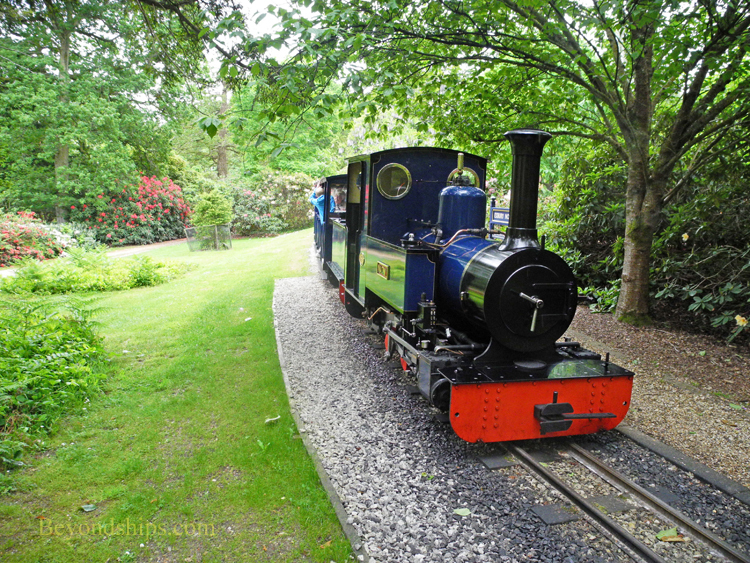 The railway is 12 ¼ inch gauge and is one and a quarter miles long. Visitors ride on benches in open coaches that are pulled by coal-burning steam locomotives. (You can also learn to drive a locomotive for £495). The train meanders through various sections of the gardens, over bridges and trestles and along grades. At various points, there are statues of wild animals that serve as a focal point. 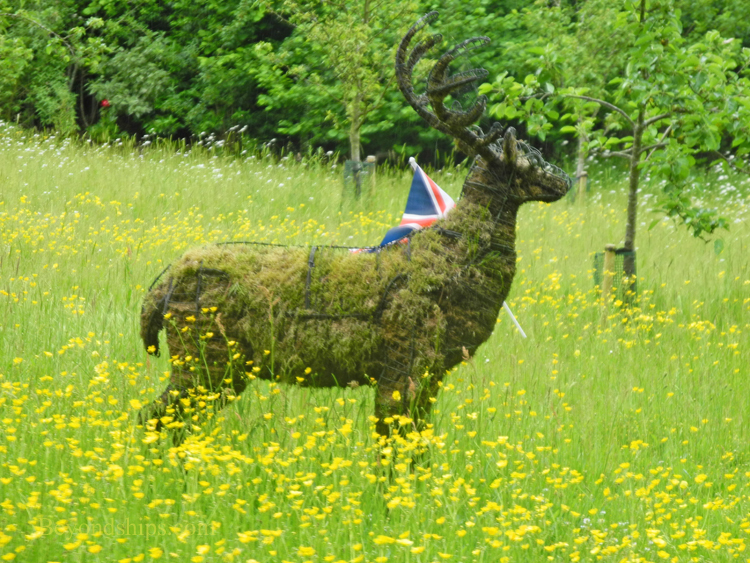 Inasmuch as this was the Diamond Jubilee weekend, several of the animals were equipped with Union Jacks.